The 12-Step Process has become a cornerstone of the modern addiction treatment model, codified and followed in thousands of treatment centers across the country. The most respected and trusted addiction treatment-advocacy organizations, including Alcoholics Anonymous (AA) and Narcotics Anonymous (NA), rely heavily on the 12-Step process and were instrumental in its development. As addiction treatment continues to evolve, however, many of those seeking help find themselves disconnected from the 12-Step process for a variety of reasons and are finding themselves in need of non-12-Step drug and alcohol treatment programs. Many critics of the 12-Step process find its foundational tenets to be outdated and not in line with evidence-based treatment methodology. Why Non-12-Step Alcohol and Drug Treatment Programs? The Substance Abuse and Mental Health Services Administration (SAMHSA) reports that more than 22.5 million people are in need of addiction treatment and that only a little more than 10 percent receive treatment. Almost two million of these individuals are between the ages of eighteen to twenty-five. Data from the Pew Research Center reveals a significant decline in the prioritization and embrace of religion and spirituality in everyday life among those born between 1990 and 1996. This shift in culture means that those who find themselves in need of addiction treatment may be looking for a secular care model. While there are less religious 12-Step treatment options, the model is still firmly based on the belief in a higher power, a concept from which this age group is comparatively distant. What Are Non-12-Step Alcohol and Drug Treatment Programs? 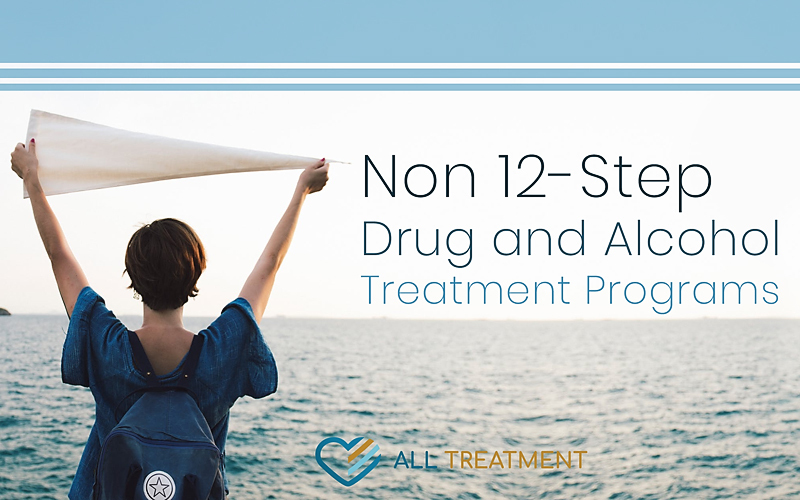 Non-12-Step alcohol and drug treatment programs are recovery programs that allow patients to draw strength and support from elements outside of the 12-Step process. Data from the Treatment Research Institute in Philadelphia indicates that only 25 to 35 percent of those who attend one AA meeting go on to become active participants. While comparatively little research has been conducted on secular or non-12-Step alcohol and drug addiction treatment programs, many find comfort and strength in these alternatives. SMART Recovery. An acronym for Self-Management and Recovery Training, SMART Recovery is a secular, scientifically based program that uses cognitive behavioral therapy and other research-based resources to help patients find their way to sobriety. One of the primary distinctions between SMART Recovery and 12-step programs is that it discourages participants from admitting powerlessness over their addictions. Women for Sobriety. Women for Sobriety is a treatment model based on the belief that gender dictates treatment needs. It is different from AA and 12-Step programs because it’s based largely on empowerment and encourages participants to change their thoughts and take control of their recovery and future. Since its inception in the 1970s, Women for Sobriety has spawned more than one hundred chapters in the United States. Secular Organizations for Sobriety. Secular Organizations for Sobriety was founded more than thirty years ago in an effort to help nonreligious alcoholics and drug addicts find their way to recovery. Its founder sought an alternative to the idea of turning one’s life over to a higher power, and one that magnifies that importance of personal responsibility and empowerment. The organization currently has more than one thousand active meetings across the United States. When an addicted person or their loved one endeavors to find an alternative to traditional 12-Step recovery, the process can be overwhelming. The reality is that most of the 14,000-plus treatment facilities in the United States offer a 12-Step approach. However, more and more non-12-Step options exist to cater to specialized populations. Interested participants or their loved ones can find a program in their area relative quickly by searching online. One of the most comprehensive resources is SAMHSA’s treatment locator. This directory breaks down searches according to geography and other specific treatment preferences. No matter what kind of help you’re looking for, whether it’s 12-Step, secular, or any other type of therapy, the most important thing is to get the help you need immediately. Addiction can affect anyone, and there are specialized treatment resources out there for every type of patient.